A quick consumer alert for anyone looking to buy an ASUS netbook from UK retailer Comet. It seems that there is an issue with the product information for the ASUS 1011PX netbook on the Comet website, as well as on the in-store tickets (at least in the two stores we checked). The Comet website clearly states that the ASUS Eee PC 1011PX netbook has a battery life of “up to 11 hours”. However, according to the manufacturer ASUS, the model that Comet is selling (their stock number 731587) only has a battery life of “up to 4.5 hours”. The model that Comet are selling is the BLK069, which comes with the smaller capacity 3-cell battery. Despite the fact that Comet’s website says the ASUS 1011PX-BLK069 “gets the job done, all day long”, and that you can use it “for up to 11 hours between charges”, the actual figure of 4.5 hours doesn’t quite measure up to this claim. 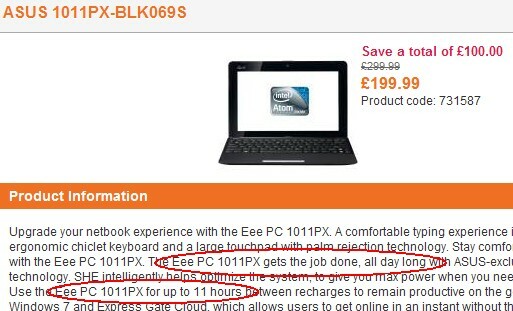 Rivals Currys seem to have the correct info on their website, so hopefully Comet will get around to fixing this misleading claim as soon as possible. We’ve told store staff, told Head Office, and reported this via the Comet Twitter and Facebook pages. In an update to this story, we’ve found an interesting issue with Comet’s Returns Policy, worth highlighting if you do decide to buy an ASUS from Comet. One of our team purchased the ASUS 1011PX, only to find when he unpacked it, that the netbook would not charge, and could not be powered from the mains adapter. Without being able to power or charge the netbook, it was pretty useless. We took the netbook back to Comet, only to discover that it’s not possible to return a faulty ASUS for a replacement on a Saturday. In-store staff checked the one-day old netbook over, and agreed that there was an apparent fault. They were unwilling to swap the machine for one that worked, until they’d got a call reference code from the ASUS call centre… who are closed at weekends. The store manager we spoke to, told us, that under the Sale Of Goods Act, they had a right to refuse an exchange until appropriate checks and tests had been made, and referred to an SLA (Service Level Agreement). We asked for a copy of this, but Comet would not provide us with a copy. We called the ASUS call centre ourselves on the following Monday. In a call lasting less than 3 minutes, they suggested that we “turn the unit to the reseller”. It seems that Comet’s frustrating returns process is there to protect Comet against a customer bringing back a product that has been “accidentally damaged”, or tampered with in some way however we understand that local managers have the authority to make a “common sense” decision at their discretion. In our case, the netbook was clearly faulty, and we find it disappointing that in-store staff at out local Comet don’t feel suitably empowered to replace clearly faulty goods , instead of hiding behind procedures and service agreements. This is all well and good, however, it’s not clear why Comet couldn’t simply replace the clearly faulty product (bought just hours previously), then get whatever codes were needed from ASUS at its leisure, without further inconveniencing the customer. Refusing an exchange and sending a customer home with a broken product, for them to return later with a tape recording of a support phone call, is just plain daft! I had a similar problem made worse by the fact it was Bank Holiday and so the Asus call centre wasn’t open. I work until 5pm and so it’s necessary for me to take time off work to exchange a faulty laptop as the call centre close at 5pm. The moral of course is never buy from Comet.